Campsea Ashe High House was a very important house in the history of Campsea Ashe. Variously owned by families such as the Sheppards and the Lowthers it was eventually pulled down in 1956. Our archives contain much information about the High House and they can be accessed here. The Sale Catalogue of the contents of the house makes fascinating reading. There were many items sold including these four chairs. 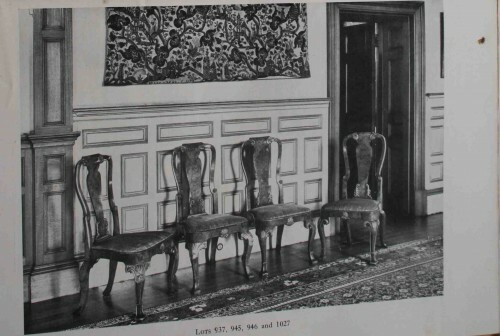 It is believed two of these chairs were again auctioned by Southeby's in 2010 and raised over £70000! We have now discovered many more items that have come up for auction, including a wonderful oil painting by George Stubbs.Click here to view them (1mb pdf file). 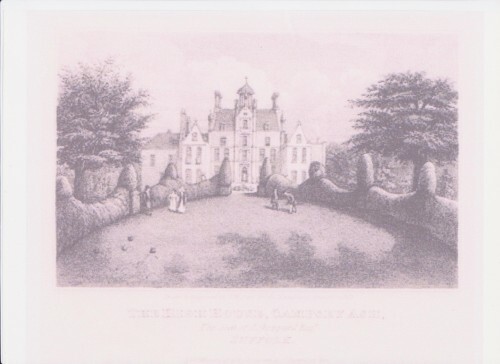 Lord Ullswater died in 1949 and his trustees sold parts of the estate, including the House with its grounds which were purchased by The Desborough Settlement Trust as a tax-saving measure. After the death of Lady Desborough in 1953, the park remained in the hands of Ullswater's nephew Arthur Lowther. This was rented to W F Turner of Ashe Green farm Campsea Ash. The House and grounds were sold to a developer who turned the coach house, stables and squash court into housing. High House fell into a ruinous state and the gardens were divided. The developer stripped the roof of the lead flashing basically for the silver content of old lead, 20%, although they could only recover,75% of the silver. As a result the water came in it decayed very quickly being mortar brick work not cement brick work. The House and its immediate surroundings were bought in 1952/3 by Lt Col Richard Schreiber ( who retired from the Army as Major ),who demolished the remains, he had no choice due to the decay, and extended the squash court to become Campsea Ashe House. Most of the rubble was carted away by Carters of Bromeswell in old army wagons, and the rubble used to make the CEL yard opposite Melton railway station. The men who demolished the house came from Lancashire and lodged locally. The Park, Shrubbery Farm, now Park Farm, including the fields around the house site, were rented from the major by W F Turner and his sons until 1976/7 when their tenancy was terminated. There were farm buildings at the High House which included a slaughter house for killing and bleeding animals including the park deer herd. Culling of them took place in June each year, usually the biggest stags were shot. Part of the walled and ornamental gardens together with the Gardener's Cottage were sold separately.